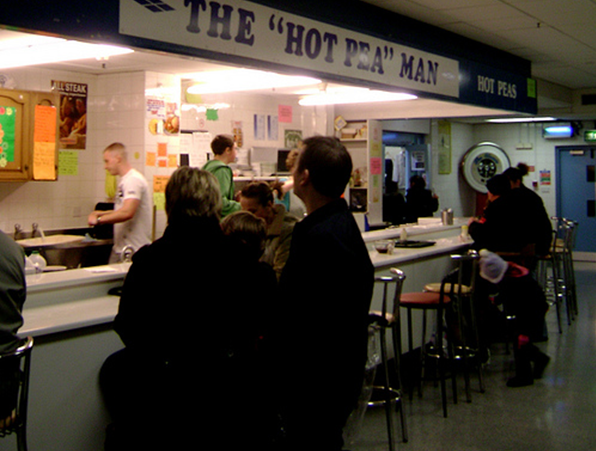 There’s a fine old Nottingham tradition that I noticed has recently been delivered a body blow, that of the ‘Hot Peas stand’ which has now disappeared after many years trading in the Victoria Market, an indoor market situated in the city’s major shopping mall, the Victoria Centre. The Victoria or ‘Viccy’ Centre as it is often known locally has been around since the turn of the 1970s after the fine old Victoria Railway Station was criminally demolished like so many of Nottingham’s imposing and historic old buildings to make way for it. Before this time the main market in Nottingham was located a few hundred yards away on nearby Huntingdon Street and known as ‘Central Market’. The Central Market represented one of the more pleasant Nottingham memories of my youth. A high roofed and atmospheric enclosed area with some wonderful aromas, colours, and characters to match. In schooldays I’d visit there every Thursday morning with mum after my swimming sessions at the Victoria Baths, organised by the NHS for physiotherapy purposes after a bad car accident. Familiar sights were of wonderful and showy displays of cut flowers, industrious butchers, greengrocers and all manner of other traders imaginable. For me though the twin targets on those Thursday mornings were the newsagents with their vast array of the latest comics which I eagerly devoured and if I was lucky, a trip to the toy stand with the possibility of a Matchbox model car. The latter could offer a lengthy decision process indeed. More to the point the Central Market was renowned for its fishmongers with their cold slabs full of produce from the likes of Hull up on the east coast of England. Here you could also enjoy the simple pleasure of standing at a counter and eating a dish of hot mushy peas with a good coating of mint sauce to taste. Perhaps this tradition is not solely a Nottingham one but certainly wherever I have roamed, I have never noted the popularity that mushy peas enjoy in Nottingham anywhere else. Traditionally on sale were cockles, prawns, whelks, oysters and all other manner of shellfish which could be bought on a small plate (if I recall correctly – no polystyrene tubs in those days) and eaten standing at the ‘bar’. The whole idea of the thing was delicious and it took a very good man to walk past those tantalising and alluring smells. Time moved on and ‘progress’ dictated that the Central Market was sadly no more. The market and specifically the fish market did endure though, on the second floor of the Victoria Centre. On leaving school and working and playing in town, the hot pea stand was always one of the first ports of call I’d head for, given the time. My usual order was for mushy peas, usually drowned in mint sauce and a small container of tasty peeled prawns. Through many a city shopping trip or a lunchtime break from college, a job or University I visited the stall there for my regular treat. Sadly, I recently walked into Victoria Market to find it no longer. Talking to a friendly second-hand book seller nearby she exclaimed that the little business had been closed a little while and that it had perhaps not diversified enough in its produce to survive, or words to that effect. It seems a little sad that such simple pleasures are not enough to satisfy any more. Mushy peas are probably the recipient of love/hate emotions with the general public but will probably never go away dare I say. A banker to find them is the annual Goose Fair in Nottingham but what do us aficionados do in the meantime? 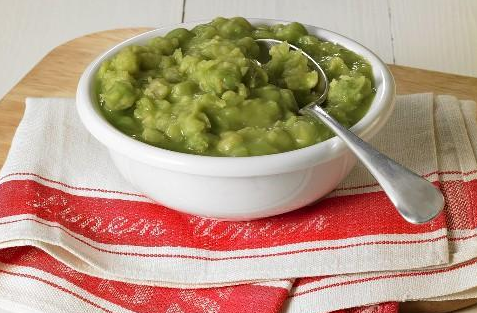 Man or woman cannot be mushy pea-less for the rest of the calendar year. I’m missing my peeled prawns already too. i can remember having the mushy peas in vic centre. amazing! just to let you know that in nearby mansfield we have a mushy pea stall on mansfield market. also sells seafood(your peeled prawns). served in polystyrene cups/trays but still taste good!!!! Been on the stall on Mansfield Market a couple of times! Thanks for reminding me! pleaseeeeeeeeeeeeeeeee bring back the hot pea man in vic centre. i moved away from notts years ago and then came back to visit. my first port of call was vic market for my hot peas but to my astonishment its gone NOOOOOOOOOOOOOOO! what is the world coming to. I’m having nightmares its not there what am i going to do now. PLEASEEEEEEEEEEEEE nottingham county councl bring back the hot pea man what are you thinking. The best stall in the vic centre and you get rid of it. Eating mushy peas and mint sauce as a snack in itself is a Midlands thing. I was born here but have moved around, and a bowl of mushy peas around the rest of the country is really just for Bonfire night, along with hot dogs and jacket potatoes. The stall in Vic Centre closed because obviously nobody was using it, which is a disgrace. There should be a Nottingham citizenship test, and if you don’t like mushy peas you have to move away. Well Blow Me Down! Here I am researching the old Central Market and ‘The Tears of a Clown’ comes up, toppa the page as well! Enjoyed reading your couple of paragraphs on the old Market; your descriptions so readily visual: a young boy choosing comics, etal. What I recall most are the smells of the place, especially: the pungent smell of the flowers and trees for sale – real sharp and sweet. And that amazing Fish Market; what a loss! The wonderful high roof in there, fishmongers wearing wellingtons and we kids having to tiptoe around the deep puddles on the floor. PS: I don’t miss the mushy peas, I’ve conquered the art of making ’em. Sorry about this Stu but forgot to say that there’s some wonderful photographs of the old Central Market on ‘Picture the Past’, 1930’s & 1950’s – you probably know this already. Christine. Hi Christine, thanks very much for the comments. Interested in your research on the old market because I loved it. Seemed to spend a fair bit of time around that area with mum as a lad as not only did we visit the market but also Victoria Baths. We also used to use Huntingdon Street bus station too as our ride home was often from there. I remember, like you, the Central Market being a wonderfully atmospheric place, with with the colours and aromas that you describe. I think it’s rather shameful that it’s not still with us. Remember the blocks of frozen fish delivered out on the streets very early in the morning? I have seen the odd pic on Picture the Past but I think I’ll have to re-visit shortly and take a look what else is there. I’d ber very interested to see the results of your research please! Hi! Thanks for the heads-up! I was pleased to see its re-emergence in a story in the Nottingham Post recently. Very pleased to see a mushy pea stall back and I reckon it will be very successful. Will be good for bringing customers into the Fish and Meat section too. Good news for all! I can relate to much of what has been said about the old ‘central market’.After walking around with my mum, we ended up with a bowl of hot mushy peas swimming in mint sauce. My old mum always came away with two large fresh crabs,( 5 bob each). Sunday tea with salad,the leftovers were made into sandwiches for Monday tea-time. I loved the Central Market and was often taken there as a kid. Such an atmospheric place and I never thought its replacement in the modern-day Victoria Centre was an adequate replacement. It was often ‘treat day’ for me when I was taken there – a Matchbox model car and comic! Sometimes after a visit to Victoria Baths. I remember the old Central Market with fondness, it was often a cold place especially around the wet fish stalls, with its sloping floor which was I suppose was easy to swill down at the end of each working day, me and my mate would go on a Saturday, hot mushy peas and a small plate of Whelks, we would then order a brown paper cone of shrimps which cost about 9d, we would then peel and eat them while making our way down toward London Road and the Forest match. I remember me and my brother buying a puppy Manchester Terrier from there too, she lived for 17 years. When I left school my first job was facing the Market at Coombes Shoe Repairs, mam would always give me a shopping list on a Friday morning for the Market and I would run over in my lunch hour to get her goodies, Conger Eel (ask for middle!) chitlings, Oxtail, hock and pigs feet! It was criminal when it was demolished, they can take away our landmarks but they cant take away our memories. Thank you for your memories there, Mick, very interesting. I agree, they can never take those away from us. it was such a shame that they decided to demolish that market. It was a real asset to Nottingham. Great to read all the posts about the old fish Market and the hot pea stall, they were all my family’s (well most) my Granddad and dad etc.. had Harry Harrison’s which was the first stall when you went through the main doors and Eric Dickinson was my Granddad’s cousin they also had a couple of other stalls scattered through the family RIP Stuart Eric’s son passed recently who had a stall. Unfortunately supermarkets killed them in the late 80’s and they never recovered.